AP D.Ed 1st year 2017-2019 Batch Examination Fee Due Dates Notification/AP D.Ed 1st year Examination Fee Due Dates Notification for 2017-2019 Batch: AP D.Ed 1st Year 2017-2019 Batch Examination Fee Due Dates Notification,The Director of Government of Examinations, Andhra Pradesh has given the D.Ed 1st Year 2017-2019 Batch Examination Fee Notification and DGE, AP has informed that the D.Ed 1st year Examinations of 2017-19 batch will be conducted in the month of June 2018. 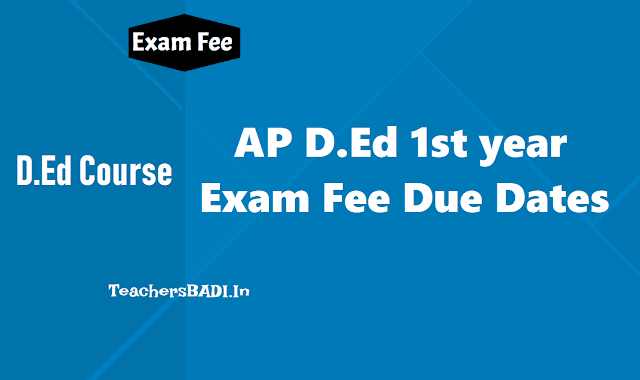 AP D.Ed First Year 2017-2019 Exams Time Table to be announced after completion of fee payment process. The failed candidates with regard to Theory/Internal/Practicals/Records in earlier batches are also eligible to appear for these Examinations as private candidates. 2017-19 విద్యాసంవత్సరానికి సంబంధించిన డీఎడ్‌ మొదటి సంవత్సరం విద్యార్థులకు వార్షిక పరీక్షలు May లో నిర్వహించేందుకు నోటిఫికేషన్‌ వెలువడిందని జిల్లా విద్యాశాఖాధికారి ప్రకటనలో పేర్కొన్నారు. 2017 - 19 విద్యాసంవత్సరాలకుగాను డీఈఎల్‌ఈడీ ప్రథమ సంవత్సరం విద్యార్థులు పరీక్షలకు ఆన్‌లైన్‌ ద్వారా దరఖాస్తు చేసుకునే గడువును April 25 వరకు పొడిగించారు. విద్యార్థులు నిర్ణీత గడువులోగా దరఖాస్తు చేసుకున్న అనంతరం నామినల్‌ రోల్స్‌ను ఆయా కళాశాలల ప్రధానాచార్యుడు డీఈవో కార్యాలయంలో సమర్పించేందుకు April 29 వరకు గడువు విధించారని చెప్పారు. b. రూ.50 అపరాధ రుసుముతో April 29 తేదీ వరకు చెల్లించాలన్నారు. రెగ్యులర్, ఒకసారి ఫెయిల్‌ అయిన అభ్యర్థులు చలానా వేర్వేరుగా చెల్లించాలని తెలిపారు. It is notified that the remittance of Examination fee for D.EI.Ed., 1st year Examinations for 2017-19 batch who were admitted in Spot admissions under convener Quota left over seats and Management Quota left over seats approved candidates only. The failed candidates of earlier batches i.e 2015-17 and 2016-18 are also eligible to appear the Examinations as Private candidates. The following are the due dates for remittance of Examination Fee and submission of nominal rolls. The Examination fee is Rs.150/-for candidate. The fee has to be remitted through consolidated challan in the Government Treasury through AP CFMS to the following Head of Account. The D.El.Ed., 1st year Examinations for 2017-19 batch who were admitted in convener quota and approved candidates under management quota will be conducted in the month of May 2019. The failed candidates of earlier batches (New Syllabus) are also eligible to appear the examinations as Private candidates. The following are the revised due dates for remittance of Examination Fee and submission of nominal rolls. The Examination fee is Rs.150/-for regular candidates. The fee has to be remitted separately for regular & once failed candidates through separate consolidated challans in the Government Treasury through AP CFMS. It is notified that the D.El.Ed., 1st year Examinations for 2017-19 batch will be conducted in the month of May 2019 (may be). The failed candidates of D.El.Ed and D.Ed (old syllabus) earlier batches are also eligible to appear for the examinations as private candidates. No further Examination will be conducted for D.Ed. (old syllabus) candidates. The following are the due dates for remittance of Examination Fee and submission of nominal rolls along with list of candidates approved by RJDSE, Kakinada & Convener DEECET 2018 in respect of spot admissions made by certain private D.Ed. colleges for 2017-19 batch. The Web link to upload applications online will be informed in due course. Good morning sir.d.el.ed 1st year 2017-2019 batch ki exam appudu untaie sir.konchem dates cheppandi.. If any changes exam dates we will post on our website TeachersBADI.In and Facebook.com/teachersbadi ..